Trading is a tough endeavor. And while it's difficult to derive a method that generates superior risk-adjusted profits in today's extremely competitive markets, it's even harder to successfully apply such a method in actual trading. 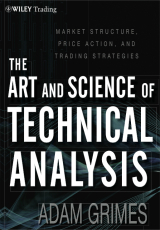 The approach found in The Art and Science of Technical Analysis -- one which, in many ways, challenges the traditional thinking of technical analysis -- can help you achieve this goal. Written in a straightforward and accessible style, this book breaks away from many of the standard trading books that have come before it. The Art and Science of Technical Analysis doesn't detail a rigid system to be strictly followed, nor does it present a group of setups and patterns that can be quickly assembled by a trader. Rather, it provides comprehensive coverage of the issues you need to be aware of in order to capture consistent profits from technically motivated, directional trading. Rounding out this discussion are three information-packed appendices. The first is a trading primer that will be useful for developing traders or managers who don't have a familiarity with the language used by traders. The second expands on some specific details and quirks of moving averages, the MACD, which are used extensively in other sections of the book. And the last appendix contains a list of trade data used in the performance analysis found in Part Four. What you need to succeed in today's markets is a verifiable edge. The Art and Science of Technical Analysis will give you that edge and put you in a better position to improve your overall trading performance.